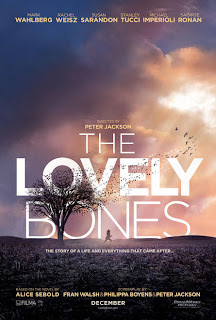 The Billionty-Oneth Geek: THE (not so) LOVELY BONES!!! THE (not so) LOVELY BONES!!! Oh Peter Jackson. Lord of the Rings Trilogy. Score. King Kong remake. Score. The Lovely Bones. BORE! What a shame. I guess I can be naive sometimes. I was pretty much under the assumption that Peter Jackson could do no wrong. When you look at his repertoire of works, it basically speaks for itself (and that includes his old school horror classics like Braindead and Bad Taste). The Lovely Bones is an adaptation of the book by the same name from author Alice Sebold. I've never read the book myself, but I have several friends who have and they all pretty much love it. Well, I hope they didn't watch this movie. The story tells of a teenaged girl named Susie Salmon who is one day murdered by a child predator in her neighbourhood. She becomes stuck in a place between earth and Heaven, where she has limited communication with the real world and tries her best to help her family track down her murderer. From there, we follow her as she watches her family cope with her being gone and as she comes to grips with being dead. I think the main downfall with this movie was the pacing. It took a lot of time to make nothing happen. The movie clocked in at around 2 hours and 15 minutes, but when it was all said and done, it felt just as long as Lord of the Rings: Return of the King The Extended Cut. I think the movie could have benefited with being 90 minutes or so. And even during these 2 hours, I wasn't emotionally invested in the characters. Perhaps it was because I couldn't care for them that made the movie drag. The one redeeming quality of the movie was all the special effects. Weta Digital did a great job of painting the spirit world creating a euphoric atmosphere. But they always do a great job so it was nothing not anticipated. This is a short review, but I don't have much more to add. I left this one disappointed. I wanted to see this one even though it looked cheesy. I think I still want to see it. We'll see!